THis THurd THursday, July 15th from 7-10pm at the City Reliquary Museum, 370 Metropolitan Ave.
Join us for the opening reception of a truly illuminating exhibit, “FORGOTTEN CITY LIGHTS: A Photographic Archive of NYC’s Street Lamposts.” This newest exhibit focuses on the often ignored but always overhead variants and styles of NYC street lamps. 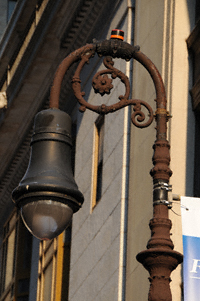 With photographs taken over the past 30+ years by Bob Mulero, an employee of the MTA and an avid toy collector, Mr. Mulero has been cataloging hundreds of New York’s lampposts since the 1970s. Mr. Mulero is joined in his historical efforts by the (seemingly) omniscient Kevin Walsh, who’s website www.Forgotten-NY.com chronicles (what appears to be) every single corner, cul-de-sac, dead-end, roundabout, and street direction in New York City. Admission is free and refreshments are also promised. Check it out! July 15, 2010 7:00 – 10:00 p.m. P.S. : You can get a sneak peek of what awaits you by checking out Mr. Walsh’s slide show as featured on the New York Times’s web site!